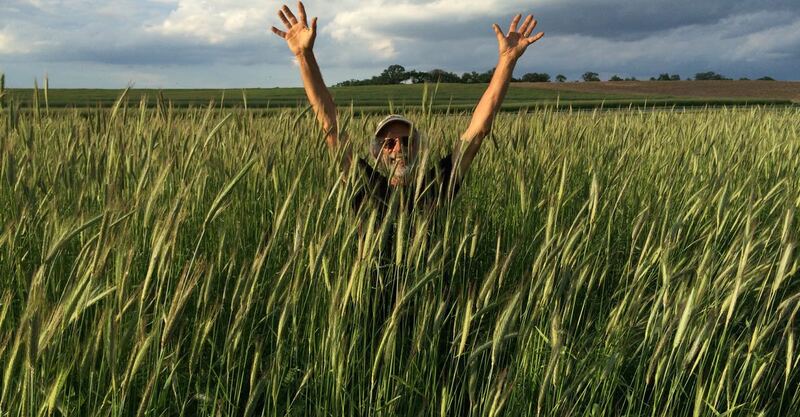 As organic agriculture developed in the USA, Wisconsin has been a leader in the movement. I planned to write a newsletter piece about this but The Milwaukee Journal Sentinel ran an article yesterday on this exact topic, titled “Wisconsin farmers leaders in organic food.” It’s nicely written. Disclaimer – Steve and I are quoted heavily in the article. We love farming in a hotbed of organic agriculture. Realisticly, what does that mean? – It means we have friends to turn to for ideas and advice when we need it. – It means we can run over to a friend’s farm to see a piece of equipment before we make a big purchase. – It means our annual Organic Farming Conference buzzes with excitement and ideas. 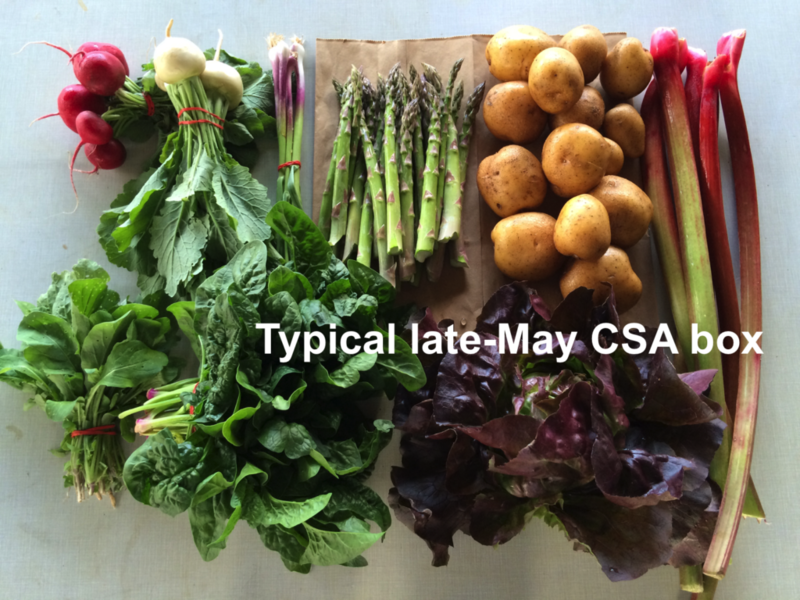 – It means there are lots of viable farmer coops and cooperative ventures, groups like FairShare CSA coalition. – It means a lot of people we know eat our food, or food grown by our friends. – It means a robust supply of organic farm supplies, e.g. composts, untreated wooden tomato stakes, etc. – It encourages local farmers to consider organics. There are two farms within five miles of us in new transition to organic production. – It means we are not isolated, oddball farmers. On a local level, the real result of Organic Valley’s prominence in WI is that organic farming is taken seriously here. Thanks for being part of this with us! We began picking strawberries today and will continue tomorrow morning. Please read our emails about upcoming u-picks here at the farm. Members at a few sites will receive small broccoli heads. Next week’s box will probably contain strawberries, asparagus, spinach, lettuce, radishes, some type of greens and more. Portobello mushrooms – These big beauties are from Mary at Hidden Valley Mushrooms in the Wisconsin Dells. We will pack them in brown paper bags. Mary says to store them in your fridge in the paper bag. Eat soon; they are fresh, lovely and perishable. Spinach – Great quality this week. Can be used for salads or for cooking but will (as usual) shrink a lot when cooked. Broccoli – The broccoli heads are small (tiny?). That happens in spring when the temperatures fluctuate wildly. The bok choy has a little more insect damage than usual but is fine to eat. Flavor is not affected. The flea beetles were voracious this spring. We have a guest recipe contributor this week! Friend and farmer-neighbor Lauren Rudersdorf provided the two recipes below. Lauren is a fabulous cook and a skilled food writer. You can read her food blog here; The Leek and The Carrot. Lauren and husband Kyle run their own farm down the road from us, Raleigh’s Hillside Farm. I think Lauren’s recipes will complement Pat’s recipes. It’s great to have two cooking perspectives to choose from. If you aren’t much of a fan of frying, these eggrolls can easily be baked in the oven (20-25 minutes at 400 degrees until nice and golden brown). Of if you want to shy away from eggroll wrappers altogether, the filling makes a fantastic salad for 4-6 people all on its own! Heat oils in a medium skillet over medium-low heat. Add the garlic and mushrooms and cook until mushrooms are just softened (about 10 minutes). Add mushroom mixture to a large bowl and wipe out pan with a paper towel. (You will use this same pan for frying eggrolls). In the large bowl, along with the mushroom mixture, add scallions, bok choy, spinach, soy sauce, rice wine vinegar, sugar, salt and red pepper flakes. Toss to combine. Taste and adjust seasonings as desired. Now you can stop here and enjoy a delicious crunchy, salty, sweet salad or you can use this as a filling for eggrolls! To fill eggrolls, lay out one eggroll wrapper. Dip your index finger in water and moisten the entire edge of the eggroll wrapper. Scoop about 1/3 cup of the filling into the middle of the wrapper. Lay the wrapper in front of you so that it looks like a diamond and one point is directly in front of you. Fold that point into the middle. Fold in each side and the roll to seal. Repeat until all 10 eggrolls are made. Pour vegetable oil into your medium skillet so it just coats the bottom. Turn heat to medium high and wait 5 minutes until hot but not smoking. Reduce heat to medium and add 3-4 eggrolls (as many as you can without crowding). Fry for about 5-7 minutes per batch until all sides are brown and crispy. Drain on a paper towel. Serve warm! My husband and I absolutely love breakfast (or breakfast for dinner) and we love hashes for their ability to pile loads of healthy vegetables into the start of our day. Our current obsession is making a vegetable heavy hash, throwing a duck egg on top and then topping the whole dish with a bit of hollandaise sauce. It’s a pretty rich (yet well-balanced) meal, but I know hollandaise can be intimidating for most. If you want to give it a whirl, here’s our go to hollandaise recipe. Add the turnips and don’t move them for a couple minutes. Use this time to season them well with salt and pepper. Once they’ve gotten a little brown underneath, begin flipping and turning them, then letting them cook again for a few minutes. The idea is not to fight them off the frying pan, once they’ve gotten a little color, it’s easier to flip them and you’ve gotten closer to your goal of getting them evenly browned. When the turnips are as crisped and brown as you’d like them — this takes about 20 minutes — add the scallions and asparagus. Stir to combine and then add a lid. (It doesn’t have to fit perfectly). Cook for an addition 5-10 minutes (thin spears of asparagus will take closer to 5 minutes, thick spears will take a bit longer) until asparagus is softened. Remove the lid, return the bacon to the pan for another minute, to reheat. Taste for seasoning and adjust if needed. Serve immediately with a fried egg on top and maybe that hollandaise if you’re feeling daring.